Lovejoy ISD Hires Trio Involved in "Alleged Misappropriation of Funds"
Ted Moore, Dennis Muizers, Mark Slavin and their attorneys spent a great deal of time and effort (six months) , including getting the Attorney General's opinion to prevent the following public information from coming to light. Lovejoy ISD hires an attorney to ambush the mother in a private meeting with school personnel. This mother had filed a public information request regarding the misappropriation of funds in McKinney ISD. The mother is banned from the campus and must copy Lovejoy Middle School Principal Gavan Goodrich on all communication with her children's teachers. The Lovejoy attorney tells her that a teacher has made a written statement accusing her of defaming "Mr. Ted Moore, Superintendent of Lovejoy ISD while at a school-sponsored function on school property". The mother asks to see the statement, and the Lovejoy ISD attorney tells her she must file a public information request to obtain it. The mother files the public information request and the attorney replies that the request is not clear. The mother resubmits the request clarifying it and the attorney responds stating the public information request will cost $871. To date (5/31/08,) Lovejoy ISD has refused to provide the proof of any allegation that would justify hiring an attorney to intimidate a Lovejoy parent who has exposed alleged wrongdoing involving Lovejoy ISD administration. 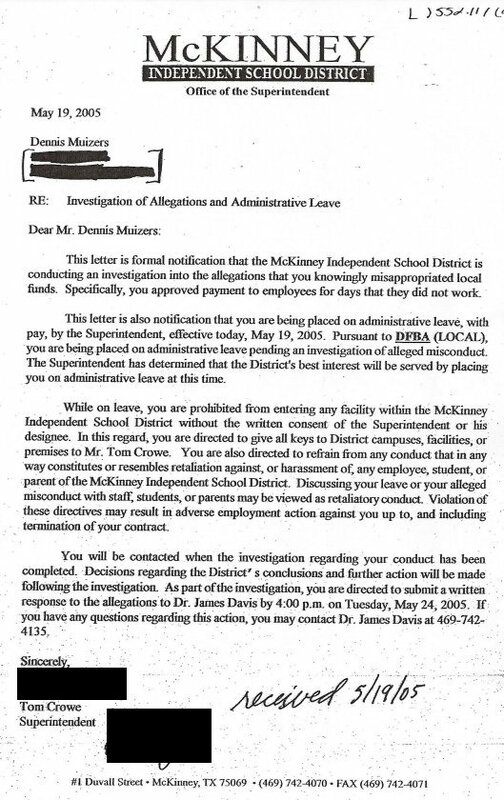 Public Information Request shows Dennis Muizers was let go for allegations he “knowingly misappropriated local funds” from McKinneyISD (MISD) just days before being hired by LovejoyISD (LISD)! The majority of these payments were made to Mark Slavin, Ted Moore’s step son, then Director of MISD’s daycare. Dennis Muizers reported directly to Ted Moore, then Deputy Superintendent of MISD. Mark Slavin, Ted’s stepson, directly reported to Dennis Muizers. The letter from MISD notifying Dennis Muizers he was under investigation and banned from all MISD schools was dated May 19, 2005. As Deputy Superintendent of MISD and Dennis Muizers’ boss, Ted Moore had to have known that MISD had asked Dennis Muizers to resign for allegedly misappropriating local funds for Ted’s stepson, Mark Slavin. Ted apparently approved of this misappropriation of funds to have hired Dennis Muizers just a couple of weeks later in LISD. Just a short 7 months later, on February 21, 2006, Ted and the LISD Board created a LISD Day Care/After School Care program and hired Ted’s step son, Mark Slavin, as the Director, 2 months later on April 18, 2006. The trio was now reunited. 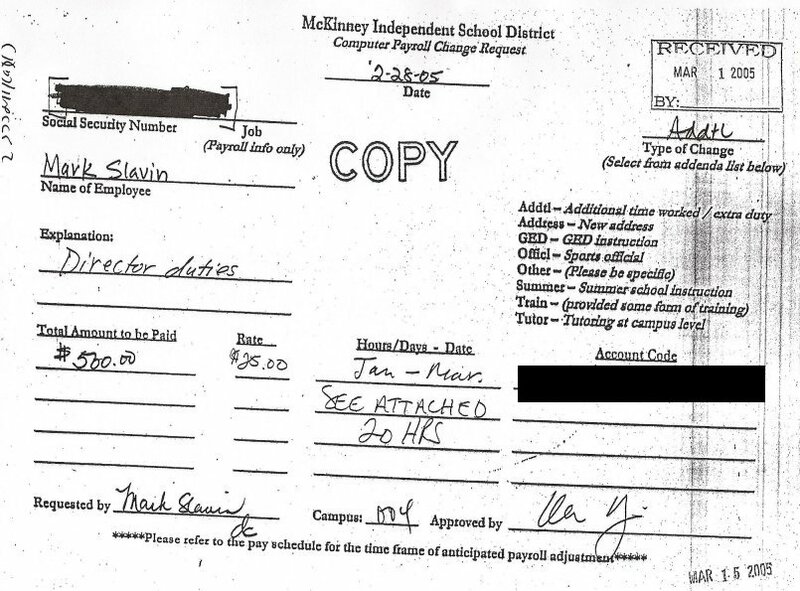 This freedom of information request to McKinney ISD was made on 11/12/07. A quick answer of “yes” or “no” was expected within 10 days. The following timeline shows the extensive efforts to keep this information from public eyes. 11/12/07 Request made to MISD for any complaints filed on Ted Moore and Dennis Muizers during their time of employment. 11/14/07 Received a letter from Larry Coker, MISD, asking clarification of the request. 2/06/08 Request reworded and resubmitted it. This time the request was more specific and asked for any complaints concerning misappropriation of funds in regards to Ted Moore, Dennis Muizers and Mark Slavin during their employment of MISD in 2004-2005. 2/20/08 Received from Mari McGowan of Abernathy, a copy of their request for an opinion to the Attorney General on whether they had to comply with this public information request. 2/27/08 Received a copy of a letter from Schwartz & Eichelbaum P.C, representing Ted Moore, Dennis Muizers and Mark Slavin, sent to the Attorney General regarding this information. One month later LISD paid $808.58 to Schwartz & Eichelbaum. Did Lovejoy taxpayers pay them to try and block information from MISD? 3/6/08 Received a copy of a letter to the Attorney General from Shane Goetz, attorney representing Dennis Muizers, regarding this information. The mother was told she was no longer allowed on any LISD campus without requesting permission from Mr. Goodrich first. And she was told all her emails, including medical information to the nurse and replies to teachers for her child who attends Hart, had to be cc’d to Gavan Goodrich. The mother told Mari McGowan at this meeting that she felt this “banning” had to do with retaliation against her for her Freedom of Information requests to MISD concerning Ted and Dennis. Lovejoy's attorney assured the mother that there was nothing in MISD’s files in regards to Dennis Muizers regarding her request, and that her sending it to the Attorney General was legally required of all Chapter 21 employees. This meeting was taped and it is suggested that all parents record any meeting with school admin. 4/13/08 In an email to Mari McGowan at Abernathy, the mother requested a copy of statements from anyone who’d claimed that she had slandered Ted Moore. She was told that in order to get those statements she would have to make a Public Information request to find what was included in the statements. To date Lovejoy has not complied with the public information request for these statements. 4/22/08 MMM aka Mari McGowan at Abernathy becomes a member of this forum. The Attorney General ruled against Abernathy Roeder Boyd & Joplin, Ted Moore, Mark Slavin, Dennis Muizers, Schwartz & Eichelbaum P.C, and Shane Goetz. They were not allowed to hide the information requested from the public. 5/6/08 Received a letter from Tonya Vining at Lovejoy ISD stating that the investigation of the mother in regards to a rumor about Ted Moore had been concluded and that the mothers was found innocent and could again enter LISD campuses. The mother was never told the outcome of the investigation and is still waiting to see the statement that was supposedly made against her. 5/15/08 The Legal Department with the Attorney General's office was contacted and asked when MISD was supposed to send the requested information. They said the school had 10 days to comply. He then said to contact MISD first and if there were any problems getting it to give them a call back. 5/15/08 Sent email to Tom Crowe, MISD Superintendent, asking where the requested information was. 5/16/08 Received reply email from Tom Crowe stating that Abernathy had put it in the mail. 5/19/08 Received package from Abernathy via certified mail. The letter from Mari McGowan at Abernathy and the postmark were dated 5/15/08, which is the same date the Tom Crowe was contacted requesting the public information. This was past the 10 business days that they are bound by law to respond in and put MISD in a position of getting sanctioned by the Attorney General. -Cover letter to requester from Mari McGowan at Abernathy. -Copy of letter to her from the AG (that I already had). -Letter from MISD to Dennis Muizers stating that he was under investigation of misappropriation of funds and banned from all campuses. -Release and Resignation form – this form allowed Dennis Muizers to submit a resignation to MISD but it was “non-rescindable” meaning he had no choice but to resign. -Dennis Muizers’ letter of resignation dated the same date as the Release and Resignation form. -Several emails and internal MISD letters that were part of the investigation.